This is the fifth instalment of a six-part introduction to the forthcoming Borough Market Cookbook, wot i hav wrote. Each post sets out a theme of the book and finishes with a recipe of the style that you can expect upon publication later this year. Pre-order the book here. The previous posts in this series explain that The Borough Market Cookbook aims to prompt readers to make the most of and take inspiration from the brilliant seasonal market produce that surrounds us. It’s about cooking from scratch using ingredients that are at their peak, as well as allowing seasonal events and happenings to prompt what you cook. Moreover, it’s about encouraging market shoppers to pick up those things that seem alien, because being bold is almost always rewarded. These are principles that transcend geography — they should be relevant to readers and cooks wherever they are based, whether they are regular visitors to this market, or at other produce and farmers’ markets in London, across the country or indeed around the world. That seasonal market shopping and cooking can and should be done anywhere is a really important message — we want the book to be useful to you wherever you live. But of course, we also want and need to root the book in Borough Market; to celebrate the people, products and events that make this space and community so special. Last month’s post recounted how there are a number of Borough Market ‘hero’ products scattered through the recipes. In this post, I want to mention an element of the book that (we hope) truly captures the essence of the Market. The book is broken into four season-based sections. Within each of those are two subsections focusing on Borough Market’s core asset: the people. We learn, in their own words, about both the background of and what a day-in-the-life looks like for eight different traders. Some, like Lizzie Vines of Wild Beef, have been here since the very start of Borough Market as a retail space, and Fred Foster of Turnips whose business began before that, when the Market was a collective of wholesalers. There’s Matt Jones of Bread Ahead, whose bakery is now a 24-hour presence under these railway arches, and Magali Russie, whose Spice Mountain stall is a colourful treasure trove. Sean Cannon talks about how his charcuterie business Cannon & Cannon has grown from a table in Three Crown Square, to one which distributes British meats to restaurants and consumers across the UK. Conversely, Jon Thrupp of Mons Cheesemongers explains how he brings the finest French cheeses to Borough Market, and Darren Brown how he still hand dives the scallops that sit on his Shellseekers stall. The eagle-eyed among you may have noticed that these individuals and their businesses represent different sectors of market traders: the butchers, the greengrocers, the bakers and confectionary makers; the Market’s larder, the charcutiers, the cheesemongers and the fishmongers. Each of the vignettes are followed by a selection of recipes that make the most of the types of ingredients those individuals—and their fellow traders—specialise in. Think of dairy and of a billowing comté soufflé; of charcuterie and platters of coppa and deep-fried capers; of butchery, and a fool-proof way to ensure that your forerib of beef is cooked to blushing pink from core through to crusty edge. If you are mathematically-minded as well as eagle-eyed, you will also have noted that only seven traders and categories have been mentioned thus far. Well, the eighth genre is ‘prepared for you’, which covers all those brilliant stalls and trollies whose produce is ready to eat or drink on the spot, or which needs just a slice or a warm through when you get home. The trader featured in the book from that category is Bill Oglethorpe, the founder of Kappacasein and maker of the legendary cheese toastie once described by one of America’s pre-eminent food writers as the “platonic ideal of toasted cheese”. The recipes that follow the interview with Bill are inspired by, or use key ingredients related to, this class of trader. To illustrate that, this month’s recipe takes the lead from Borough Market’s pasta specialists: of the top-quality dried pasta at Gastronomica, the ever-popular plates served at Padella, and the pasta cooked to order by La Tua, and indeed their cabinets of quality fresh pasta that can be taken home for supper—the ultimate meal in minutes. Indeed, if you delve into La Tua’s chilled section, you will find packs of fresh, ready-rolled lasagne sheets. These can (quickly) form the basis, obviously, of a homemade lasagne that’s incomparable to one made with dried sheets. But they can also be the base for an even faster, low-effort supper: a kind of open lasagne, where the sheets are draped over and under seasonal vegetables, fragrant herbs and a few blobs of quality ricotta. In autumn and winter this might be a wild mushroom or pumpkin number, but right now we’re in the midst of a courgette glut, so courgette, mint, lemon and ricotta it is. The Borough Market Cookbook: Recipes and Stories From a Year at the Market will be published 4th October 2018. Pre-order your copy now. 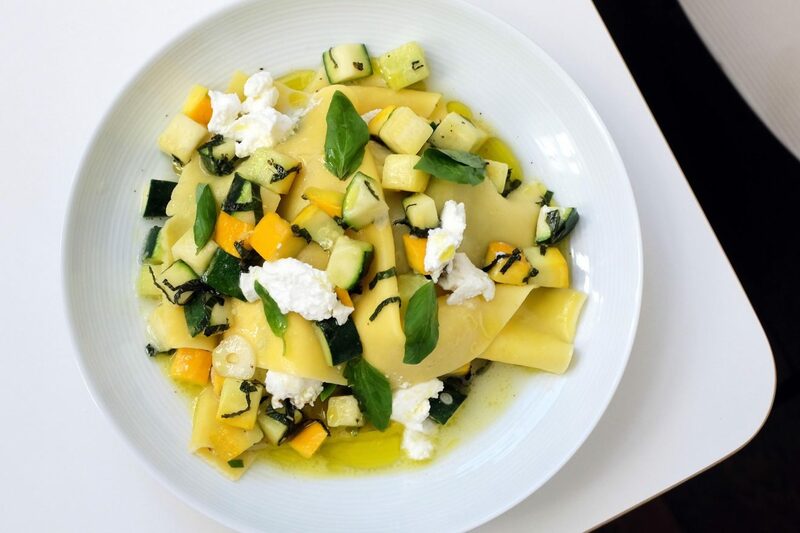 This is a low-effort, high-reward recipe that makes the most of La Tua pasta’s fresh lasagne sheets, as well as the courgettes and summer squash so prevalent at the Market at the moment. Lemon zest, fresh herbs and cooling ricotta continue the seasonal theme. It’s quick to put together, not least because the fresh pasta sheets have been prepared for you, and so is ideal for a mid-week supper or impromptu entertaining at the weekend. Bring a large pan of well-salted water to the boil. Meanwhile, prepare all the ingredients: cut the courgettes into 1cm dice, slice the garlic, zest and juice the lemon, grate the Parmesan and shred the herbs. Place a wide saucepan over low heat. Add 2 tablespoons of olive oil, then the courgettes and lemon zest. Heat for a minute, then add the garlic. Continue to heat the courgettes for 2-3 minutes more, stirring occasionally and just warming them through, rather than charring or stewing them. The water should arrive at the boil while the courgettes are cooking. Drop the lasagne sheets in — 2 per person — and cook for 3 minutes. When the pasta has been cooking for 1 minute, transfer a ladle of water from the pasta pot into the courgettes and add the parmesan. Gently stir the water and cheese through the courgettes, until the cheese is fully melted and has emulsified into the sauce — this should take 30-60 seconds. Remove the sauce pan from the heat and add the lemon juice, shredded mint and basil and a good few twists of the black pepper mill. Mix well. Drain the pasta through a sieve. Pile a large spoonful of courgettes (and juices) in the middle of each plate and top with a teaspoon of ricotta. Drape a lasagne sheet over the courgettes — crinkle and fold, if you can. Spoon more courgettes over those sheets and another teaspoon or two of ricotta. Then lay the second lasagne sheet on each pile, finishing with the remaining courgettes, juices, ricotta and the whole basil leaves. Drizzle with a quality, grassy extra virgin olive oil and serve.